Happy January! I can't believe that is my first WIR of 2017 already. 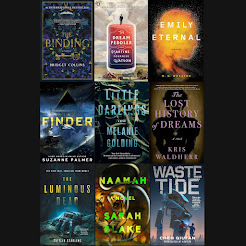 Hopefully, I will have lots of fantastic books to tell you about this year. I am going to give you the review 'sandwich' again. For those of you who aren't familiar with this it's the same concept as giving feedback - good news, bad news, good news. I have used this before on my WIR and here it is again. So what did I read? 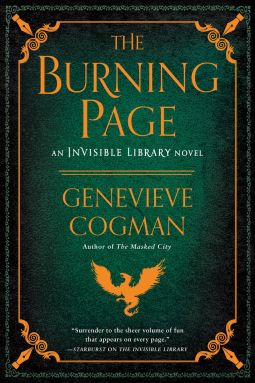 I will admit that I read Genevieve Cogman's The Burning Page back in October when I received it via NetGalley. However, I couldn't tell you about it as it won't be published until January 10th. I was really having to bite my tongue not to let anything slip out....or should I say bite my fingers? Anyway, I was really looking forward to the next instalment of the Invisible Library series and Cogman doesn't disappoint. In this instalment The Library is in lockdown. Librarians are being killed, doors to the library are being rigged to explode...and worse and it's all down to Library's arch nemesis Alberich. Our favourite Librarian Irene is still on probation after the events of the previous book but that doesn't stop her and her side kick Kai from finding themselves in more danger than they can handle. Alberich is determined that the Library dies and Irene with it so she will need every trick up her sleeve and the help from her friends to keep both herself and her beloved Library from falling to Alberich's malevolent plot. 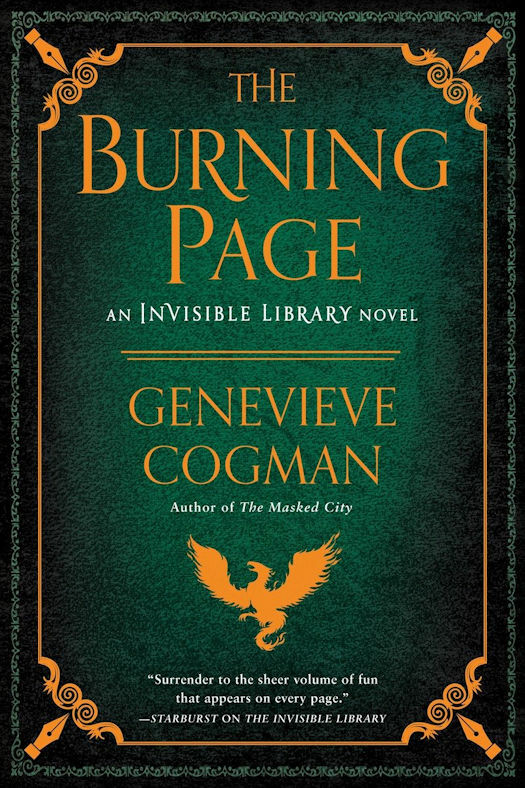 I love this series and The Burning Page is very good. 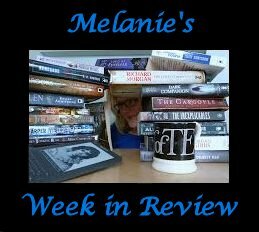 I enjoy the growing friendship between Irene and Kai and we learn more about the inner workings of the Library in this instalment. It is very action packed with Irene pulling off one escape after another from the evil Alberich. However, I didn't love it as much as I have loved books 1 and 2. Where I felt the teeniest tiniest let down was Irene's dubious choice of romantic partner. It just didn't seem like something she would do or someone she would be attracted to and came out of the blue. I also thought it could have easily been the final instalment of the series so I am a bit concerned what future books will hold when the over arching plot seems to be wrapped up. I am really splitting hairs though as it was quite good. 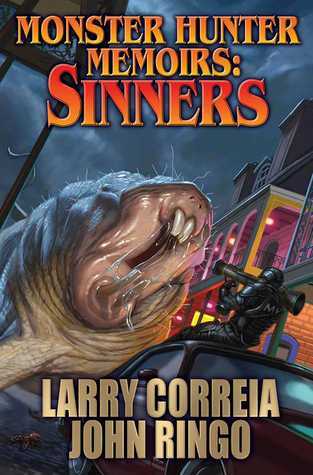 For the middle of this review sandwich was Monster Hunter Memoirs: Sinners by Larry Correia and John Ringo. I started this new spin off series focussing on the memoirs of the monster hunter Chad back in December and I found book 1 Grunge a bit disappointing. However, I almost gave up on book 2 partway through. What I liked about the original series was that Owen was very likeable and I liked him and the other supporting characters. In contrast Chad is egotistical, maniacal womaniser and quite frankly a bit of a jerk. The plot consisted of - kill monster, eat bourbon chicken or barbeque (he has moved to New Orleans now), pick up a lady, kill monster, repeat. It was just a tad dull. I don't think I will continue with this series. Book 3 of this WIR was a real book! The lovely Qwill sent me a care package and in it was Belle Chasse by Suzanne Johnson. I don't often read actual books anymore so this was a real treat..plus it was hardback so made it even more 'treatier'. This is book 5 of the Sentinels of New Orleans and the now unemployed wizard DJ has been shot, has a death sentence hanging over her and is in hiding in the Beyond. A war is about to break out between the wizards, the Fae and the Elves and guess who is caught in the middle? DJ is desperate to clear her name, keep her pregnant friend safe and get back in the arms of her hunky shapeshifter boyfriend. I enjoyed Belle Chasse and I definitely loved the cover. I don't think I liked it quite a much as the other books. 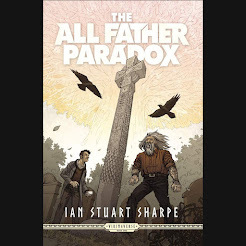 I felt this was a bit of a filler book and not a lot happens until the final few pages and even so this didn't really advance or resolve the over arching plot that much. I am not saying that nothing happened but I felt that Johnson could have been a bit bolder in drawing this series to a close. I am a bit worried it will continue and continue and continue with not much happening apart from DJ saying how much she misses New Orleans. Although, Johnson doesn't mess around and bad things still happen to good people in this instalment so definitely worth a read. Plus love the cover! That is it for me for my first WIR of 2017. 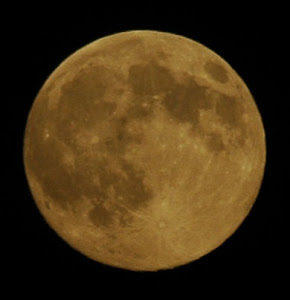 I have read a couple of crackers this week that I am looking forward to telling you all about next week. Until then Happy Reading! Librarian spy Irene and her apprentice Kai return for another “tremendously fun, rip-roaring adventure,” (A Fantastical Librarian) third in the bibliophilic fantasy series from the author of The Masked City. Irene’s longtime nemesis, Alberich, has once again been making waves across multiple worlds, and, this time, his goals are much larger than obtaining a single book or wreaking vengeance upon a single Librarian. He aims to destroy the entire Library—and make sure Irene goes down with it. A NEW NOVEL IN THE MONSTER HUNTER MEMOIRS SERIES. TWO AUTHORS, WHO COMBINED HAVE OVER FOUR MILLION BOOKS IN PRINT AND 10 NEW YORK TIMES BESTSELLERS, TEAM UP TO EXPAND LARRY CORREIA'S MONSTER HUNTER UNIVERSE! 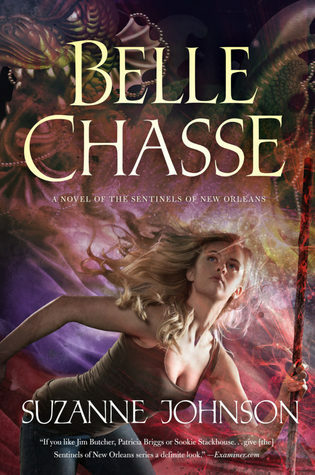 Suzanne Johnson's "strong and intriguing" (Publishers Weekly) urban fantasy series continues with Belle Chasse. The Sentinels of New Orleans series has earned starred reviews from Library Journal ("a resourceful heroine who relies on her magical ingenuity") and PW ("vivid...a lively tale jam-packed with action, magic, and intriguing plot twists"). It's time to choose sides. Friends will become enemies, enemies will become allies, and not everyone will survive. DJ and her friends will learn a hard lesson: sometimes, even the ultimate sacrifice isn’t enough.